AAA Studio has released FurryBall RT 1.1, the latest update to its GPU-based production renderer, adding a real-time noise-reduction filter, real-time post processes, and supporting more of Maya’s advanced features. The update would have been FurryBall 5.1 under the old numbering system, but AAA Studio elected to rename the software FurryBall RT on the last major update in July, following an overhaul of the core code. The major feature in the update is a new real-time noise reduction filter, shown in the image above. 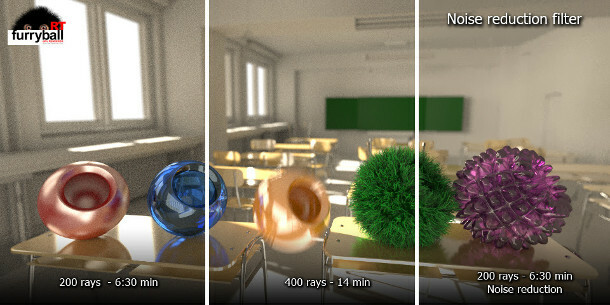 Like the new Denoise function in RenderMan, it removes noise from raytracing renders, enabling users to use a lower sampling value, resulting in a faster but noisier raw render that the filter then cleans up. FurryBall 5.1 also introduces a number of other interactive post processes for tuning images without re-rendering, including Glow, Chromatic Aberration and Exposure. The camera’s film gate, resolution gate, safe action and title areas can also now be shown in the viewport. In addition, FurryBall RT now supports some advanced features in Maya that didn’t make it into the 5.0 release, including XGen and Bifrost; while FurryBall lights can now be displayed in Maya’s Viewport 2.0. AAA Studio is currently running a poll on its forum for which other features to implement next. FurryBall RT 5.1 is out for Maya 2011 and above, running on 64-bit Windows Vista and above. Linux and Mac OS X support is planned. A new perpetual licence costs €599 (around $650), with rental starting at €99/month. Every new licence currently ships with a free licence of FurryBall 4.8, the last version of the software to support 3ds Max and Cinema 4D. Max and C4D support in FurryBall RT itself is planned later this year.